For the volcanic cone, see Mount Atlas. The Atlas Mountains (Arabic: جِـبَـال الْأَطْـلَـس‎, translit. jibāl al-ʾaṭlas; durar n waṭlas) are a mountain range in the Maghreb. It stretches around 2,500 km (1,600 mi) through Morocco, Algeria and Tunisia. 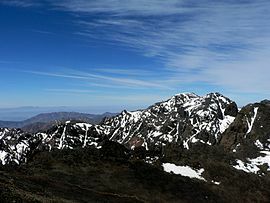 The range's highest peak is Toubkal, with an elevation of 4,167 metres (13,671 ft) in southwestern Morocco. It separates the Mediterranean and Atlantic coastlines from the Sahara Desert. The Atlas mountains are primarily inhabited by Berber populations. The terms for 'mountain' in some Berber languages are adrar and adras, which are believed to be cognates of the toponym Atlas. The mountains are home to a number of animal and plants unique in Africa, often more like those of Europe; many of them are endangered and some have already gone extinct. The basement rock of most of Africa was formed during the Precambrian supereon and is much older than the Atlas Mountains lying on the continent. The Atlas was formed during three subsequent phases of Earth's geology. The first tectonic deformation phase involves only the Anti-Atlas, which was formed in the Paleozoic Era (~300 million years ago) as the result of continental collisions. North America, Europe and Africa were connected millions of years ago. The Anti-Atlas Mountains are believed to have originally been formed as part of Alleghenian orogeny. These mountains were formed when Africa and America collided, and were once a chain rivaling today's Himalayas. Today, the remains of this chain can be seen in the Fall Line region in the Eastern United States. Some remnants can also be found in the later formed Appalachians in North America. A second phase took place during the Mesozoic Era (before ~66 My). It consisted of a widespread extension of the Earth's crust that rifted and separated the continents mentioned above. This extension was responsible for the formation of many thick intracontinental sedimentary basins including the present Atlas. Most of the rocks forming the surface of the present High Atlas were deposited under the ocean at that time. Finally, in the Paleogene and Neogene Periods (~66 million to ~1.8 million years ago), the mountain chains that today constitute the Atlas were uplifted, as the land masses of Europe and Africa collided at the southern end of the Iberian Peninsula. Such convergent tectonic boundaries occur where two plates slide towards each other forming a subduction zone (if one plate moves underneath the other), and/or a continental collision (when the two plates contain continental crust). In the case of the Africa-Europe collision, it is clear that tectonic convergence is partially responsible for the formation of the High Atlas, as well as for the closure of the Strait of Gibraltar and the formation of the Alps and the Pyrenees. However, there is a lack of evidence for the nature of the subduction in the Atlas region, or for the thickening of the Earth's crust generally associated with continental collisions. In fact, one of the most striking features of the Atlas to geologists is the relative small amount of crustal thickening and tectonic shortening despite the important altitude of the mountain range. Recent studies suggest that deep processes rooted in the Earth's mantle may have contributed to the uplift of the High and Middle Atlas. The Atlas are rich in natural resources. There are deposits of iron ore, lead ore, copper, silver, mercury, rock salt, phosphate, marble, anthracite coal and natural gas among other resources. Satellite photograph of the High Atlas and Anti-Atlas Mountains. 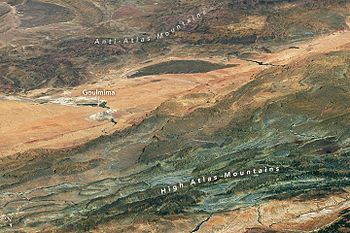 North is at the bottom; the city of Goulmima can be seen at center left. Anti-Atlas, High Atlas and Middle Atlas (Morocco). Tell Atlas (Morocco, Algeria, Tunisia). The Anti-Atlas extends from the Atlantic Ocean in the southwest of Morocco toward the northeast to the heights of Ouarzazate and further east to the city of Tafilalt (altogether a distance of approximately 500 kilometres or 310 miles). In the south it borders the Sahara. The easternmost point of the anti-Atlas is the Jbel Saghro range and its northern boundary is flanked by sections of the High Atlas range. It includes the Djebel Siroua, a massif of volcanic origin with the highest summit of the range at 3,304 m. The Jebel Bani is a much lower range running along the southern side of the Anti Atlas. The High Atlas in central Morocco rises in the west at the Atlantic coast and stretches in an eastern direction to the Moroccan-Algerian border. It has several peaks over 4,000 m (2.5 mi), including the highest summit in North Africa, Toubkal (4,167 m (13,671 ft)) and further east Ighil m'Goun (4,071 m (13,356 ft)) the second major summit of the range. At the Atlantic and to the southwest, the range drops abruptly and makes a transition to the coast and the Anti-Atlas range. To the north, in the direction of Marrakesh, the range descends less abruptly. On the heights of Ouarzazate the massif is cut through by the Draa Valley which opens southward. It is mainly inhabited by Berber people, who live in small villages and cultivate the high plains of the Ourika Valley. Near Barrage Cavagnac  there is a hydroelectric dam that has created the artificial lake Lalla Takerkoust. The lake serves also as a source for fish for the local fishermen. The largest villages and towns of the area are Ouarzazate, Tahannaout, Amizmiz, Imlil, Tin Mal and Ijoukak. The Middle Atlas is completely in Morocco and is the northernmost of its main three Atlas ranges. 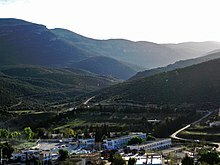 The range lies north of High Atlas, separated by the Moulouya and Oum Er-Rbia rivers, and south of the Rif mountains, separated by the Sebou River. To the west are the main coastal plains of Morocco with many of the major cities and, to the east, the high barren plateau that lies between the Saharan and Tell Atlas. The high point of the range is the jbel Bou Naceur (3340m). The Middle Atlas experiences more rain than the ranges to the south, making it an important water catchment for the coastal plains and important for biodiversity. It is home to the majority of the world's population of Barbary macaque. The Saharan Atlas of Algeria is the eastern portion of the Atlas mountain range. Though not as high as the Grand Atlas, they are far more imposing than the Tell Atlas range that runs to the north of them and closer to the coast. The highest peak in the range is the 2,236 m (7,336 ft) high Djebel Aissa. They mark the northern edge of the Sahara Desert. The mountains see some rainfall and are better suited to agriculture than the plateau region to the north. Today most of the population of the region are Berbers (Imazighen). The Tell Atlas is a mountain chain over 1,500 kilometres (930 mi) in length, belonging to the Atlas mountain ranges and stretching from Morocco, through Algeria to Tunisia. It parallels the Mediterranean coast. Together with the Saharan Atlas to the south it forms the northernmost of two more or less parallel ranges which gradually approach one another towards the east, merging in Eastern Algeria. At the western ends at the Middle Atlas range in Morocco. The area immediately to the south of this range is the high plateau of the Hautes Plaines, with lakes in the wet season and salt flats in the dry. The Aurès Mountains of Algeria and Tunisia are the farthest eastern portion of the Atlas mountain range. The Aurès natural region is named after the range. 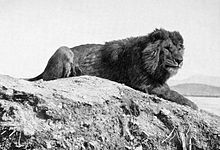 A male Barbary lion photographed in Algeria by Alfred Edward Pease in 1893. Examples of plants include the Atlas cedar, European black pine, and Algerian oak. Examples of animals included the Atlas bear (extinct), Barbary macaque, Barbary lion (extinct in the wild), Barbary leopard, Barbary stag, Barbary sheep, Atlas Mountain badger, North African elephant (extinct), North African aurochs (extinct), Cuvier's gazelle, Northern bald ibis, dipper, and Atlas mountain viper. Wikivoyage has a travel guide for Atlas Mountains. Wikimedia Commons has media related to Atlas Mountains. ^ "Atlas Mountains - Students | Britannica Kids | Homework Help". kids.britannica.com. Retrieved 2017-07-07. ^ "Atlas Mountains: Facts and Location | Study.com". Study.com. Retrieved 2017-07-07. ^ a b Pease, A. E. (1913). The Book of the Lion John Murray, London. ^ Bryden, H. A. (ed.) (1899). Great and small game of Africa Rowland Ward Ltd., London. Pp. 544–608. ^ Van Lavieren, E. (2012). The Barbary Macaque (Macaca sylvanus); A unique endangered primate species struggling to survive. Revista Eubacteria, (30): 1–4. ^ Emmanuel, John (September 1982). "A Survey Of Population and Habitat of the Barbary Macaqu Macaca Sylvanus L. In North Morocco". Biological Conservation. 24 (1): 45–66. doi:10.1016/0006-3207(82)90046-5.